Click here to jump to my product selections of the best water timers. Water timers are an absolute godsend for busy gardeners. Though I enjoy hand-watering my plants, it’s always a relief to know that I can leave them for days and weeks at a time without any issues, especially in the hot summer months. 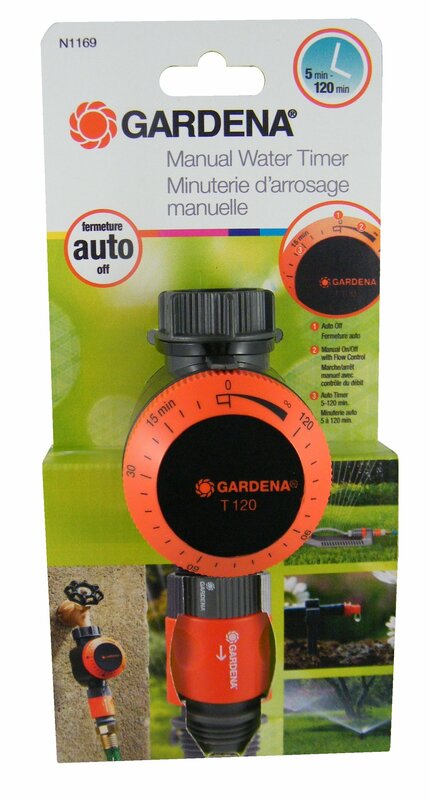 A water timer will be useful whatever the size of your garden – I use mine on my balcony with a homemade irrigation system consisting of nothing more than a punctured hose line and an outside faucet. 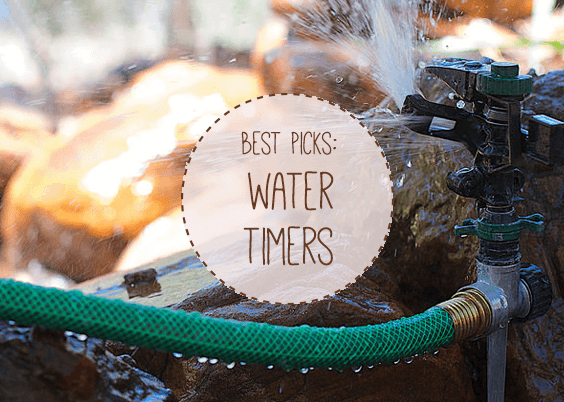 For this guide I’ve picked five of my favourite water timers. I’ll also offer some general buying advice about what to look for and how to distinguish between the different models. Irrigation controllers are usually used for managing sprinkler systems. 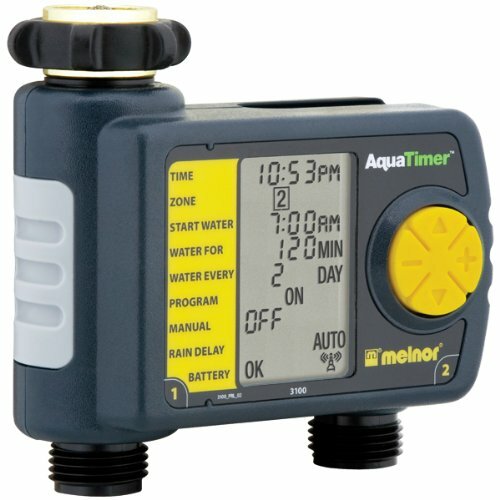 A water timer (or “hose timer”) is an appliance that controls the release of water from a pipe or faucet through an electrically-controlled valve. 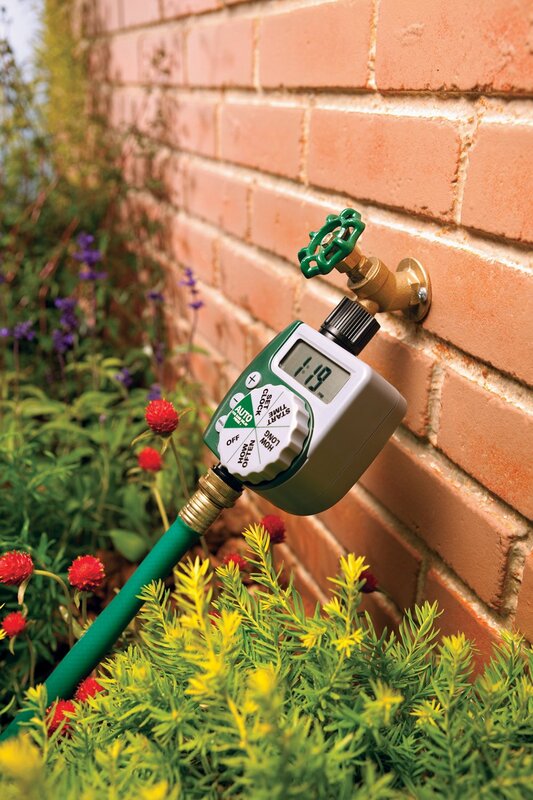 It allows gardeners to specify time periods for the release of water, usually through some kind of irrigation system, often sprinklers (they can also be called irrigation timers). Water timers attach to an outside tap. 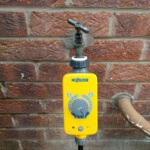 Water timers are designed to either attach to a normal garden tap or be fully integrated into the piping system. 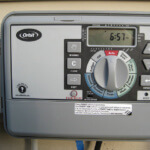 Generally speaking there are two kinds of timers you’ll come across: those for residential gardeners and more involved types designed to manage entire irrigation and sprinkler systems and numerous pre-installed valves. The latter are usually called “irrigation controllers”. You can also buy “smart controllers” that can be operated via wifi on a mobile phone. If you’re curious about how full-scale irrigation systems work, have a look at the video in the “resources” section below. This article will focus on timers designed for small-scale residential use, designed to be attached to an outside faucet. When the term “water timer” is used, it’s these that are usually being referred to. Mechanical vs. electromechanical: You have two options when it comes to picking a water timer. Purely mechanical models rely on a manual timer that can be set to allow water to run for a certain period before automatically turning off. They need to be set every time you want to use them (like an egg timer). Electromechanical timers can be set to run at intervals on a consistent, indefinite basis. Rain delay: Make sure that your model has a function to override any set programmes and stop water flow for set intervals (usually 24hr, 48hr and 72hr periods) during rainfall. Manual settings: Along with the ability to set start time, finish time and frequency, make sure that any timer also has manual options. Guarantee: Good products will usually come with a guarantee of several years. Advanced programming: If you just want a basic mechanical solution then this will be less of an issue. If, however, you want to be able to set intervals of several days – to water, for instance, every second or third day, or even on specific days – then make sure that this functionality is included. Whenever I’m putting together a list of tools to review, I always try to include top models from some of the top gardening manufacturers, and Gardena is definitely up there as one of the best. This basic manual timer is a great option for anybody that only wants the ability to set a single interval (5 to 120 minutes). The feature that puts this manual timer above its competitors is the inclusion of a flow control mechanism. This allows you to change the volume of water passing through the valve. On typical swivel taps this isn’t too much of an issue, but it can come in handy if you have an on-off faucet. It’s a little bit more expensive than other manual timers but it’s very well-made – the Germans, again – and there are numerous reports citing how long-lasting it is. Orbit Irrigation is one of the biggest companies in the residential irrigation space and their products are usually of great quality. This single-dial timer is perfect for those who are looking for a simple, easy-to-use solution, with advanced programming functionality, that can be up and running in minutes. It needs to be attached to a hose faucet (rather than to the main faucet directly) so bear in mind you’ll have to buy one if your don’t have one already. 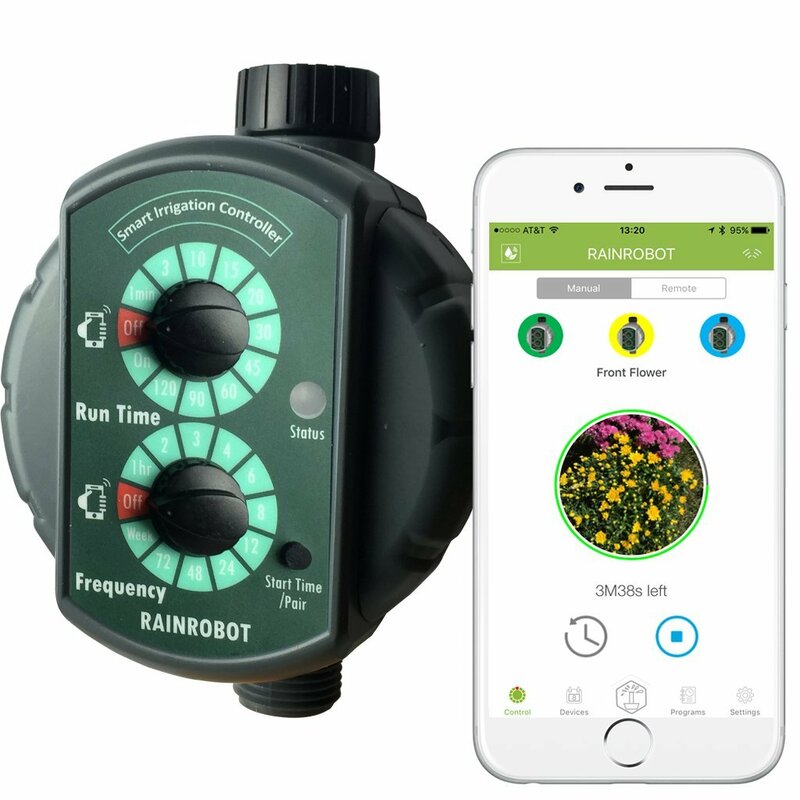 It has all the features you would expect: a large screen, options to set watering start-times, duration and frequency, a rain delay function, and a manual operation mode. The beauty of this product is its simplicity and it’s easily one of the best single-faucet products that I’ve come across. 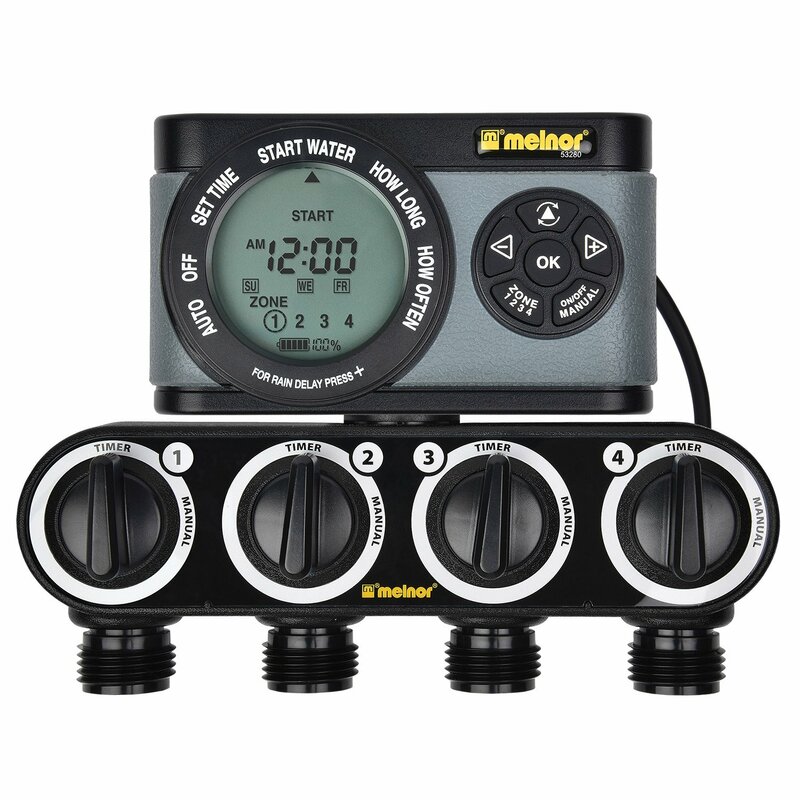 The Melnor 2-Zone digital timer is a great option if you’re running a larger irrigation system and want to attach two hoses. Intervals can be set regularly on a weekly basis, up to six time times a day. There’s also a simple manual mode and rain delay function. It runs on two AA batteries. Of all the products on this list, this is my timer of choice. Despite its very simple interface (which I rather like), the programming options are quite varied due to the fact that it can be operated remotely via a smartphone (iPhone or Android). Some of the functions are really useful, such as the automatic rain delay that works on the basis of weather information, or the battery status display. If you’re a fusty old gardener that doesn’t like new technology – what’s this whole “internet of things” about anyway? – you can always just revert back to the manual dials. A great little piece of kit that will prevent you from having to wander out into the rain to manually turn the water flow off whenever a storm beckons. The great thing about this timer – aside from the fact that it will take 4 different hoses – is that you can set it to run on specific days. Just want your sprinklers to water on Tuesdays and Fridays at 10AM when you’re away? No problem. It’s from Melnor and it’s a high-quality piece. Everything from the zinc nuts to the clean display to the rubber buttons point towards the care that’s been put into making it. Each zone can be individually programmed and each outlet has its own manual control. What are your thoughts? Have you tried any of the products on this list? Drop me an email via the about us page and let me know! The video below is a good into to irrigation systems and helpful for understanding how irrigation controllers work.